This special petition is a tool to generate grassroots support for raw milk access in Montana and serves as a private forum (though visible to the public) to post your comments and concerns. We'll email timely action alerts as warranted. Please use this petition to express your interest in supporting access to farm fresh raw milk in Montana. Type your comments in the box below; you can also send your message to a newspaper editor by choosing an option under "Select your recipients". The Montana Raw Milk Bill (HB 325) aims to create an exemption allowing on-farm sales direct to consumers by raw milk producers with a small dairy herd [i.e., limiting the number of lactating animals producing raw milk for human consumption to 10 cows or 20 goats or 20 sheep]. The producer must obtain a permit from the Department of Livestock (DOL). HB 325 also affirms the legality of herdshare arrangements and would require only that the individual receiving raw milk have a written bill of sale showing purchase of an ownership interest in the dairy animal(s). A. Feb. 1 onward: Submit a comment expressing support of HB 325. Please encourage others to do the same. These will be compiled and sent to the bill sponsor and possibly other legislators. You will be added to the list for action alerts. B. Feb. 4-8: Prepare a statement (1250 characters or less) to send through the Montana Legislature website to the House Agriculture Committee before the hearing on February 9, 2017. A printed copy of your message will be delivered to each committee member. Go to MT Legislature FORM. C. Follow-up Call: Identify your state legislators. IF a committee member is YOUR state Representative, then follow up with a courteous phone call. Montana legislators use their personal phones so please be respectful of that when leaving voicemail. Go to WHO REPRESENTS ME. 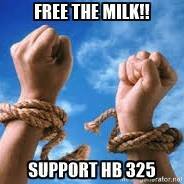 The one click form below will send your personal message to all your government representatives selected to the left below, with the subject " I Support HB 325 for direct raw milk sales in Montana." At the same time you can send your personal comments only as a letter to the editor of your nearest local daily newspaper if you like.